Inscribed on the reverse in ink (in another hand): J.C.
Inscribed on the verso in ink (in another hand): J.C. This attractive oil study of the back of a terrace of houses is a remarkable new discovery. It can be securely dated on stylistic grounds to the second half of Constable’s career, and was painted by him during the period that he lived in Hampstead. Constable’s career falls neatly into two distinct phases: the earlier Suffolk years lasting until about 1816, during which he travelled regularly between London and his native East Bergholt and when his art was dominated by Suffolk scenes; and the later London years following his marriage to Maria Bicknell, when he added new locations such as Hampstead, Brighton and Salisbury to his repertoire of subjects. In 1817 Constable moved with his new wife to a house in Keppel Street in Bloomsbury, an area in London where many artists lived at this date. However, Maria’s health was delicate, and following the birth of their second child in 1819, Constable – whilst retaining this house in central London – decided to rent a cottage in Hampstead where she and the children might benefit from the cleaner air over the summer months. He was to rent properties in Hampstead for his family most years until 1827 when, only a year before Maria’s death, he took a lease on a house in Well Walk which he was to retain until 1834[i]. At the beginning of the nineteenth century Hampstead, some five miles north of London, was still a village. However, it was well connected with central London by a regular coach service, enabling Constable to benefit from the semi-rural environment and village life there whilst also remaining in touch with the busy metropolitan art world. Furthermore, the new location soon became a huge stimulus for his art. Constable was especially attracted to Hampstead Heath, perhaps partly because – like the area of Suffolk where he had been brought up – it was a working landscape, the heath being used at this date by sand-diggers and grazed by cattle, sheep and donkeys. From this elevated position, Constable could also capture the dynamic and blustery skies, as in Hampstead Heath, with the house called ‘The Salt Box’, c.1820 (Tate, London; fig. 1). It was also of course in Hampstead, in 1821 and 1822, that Constable painted his famous series of individual cloud and sky studies, in oils on paper or board[ii]. Most of these remarkable sketches were probably painted on the heath itself, in the open air. However, some of them – especially those examples which show skies glimpsed over the tops of buildings – seem to have been painted by Constable close to, or from the back of, the lodgings he took during those same two summers in Hampstead at 2 Lower Terrace. Lower Terrace is located close to the western side of Hampstead Heath. Constable painted a view of the Terrace from the street side showing numbers 3 and 4 (View of Lower Terrace, Hampstead, c.1822, Victoria and Albert Museum, London; fig. 2). We can assume from this study that number 2 Lower Terrace – which is just outside Constable’s composition to the left – would have had a similar frontage in red brick. There are also a number of views by Constable dating from around this time that are assumed to have been painted from the back of 2, Lower Terrace. For example, a sketch showing a wooden garden shed probably depicts the coal shed in the garden of 2 Lower Terrace which Constable cleared for use as a small studio in 1821[iii] (View in a garden, with a shed on the left, c.1821, V&A; fig. 3). 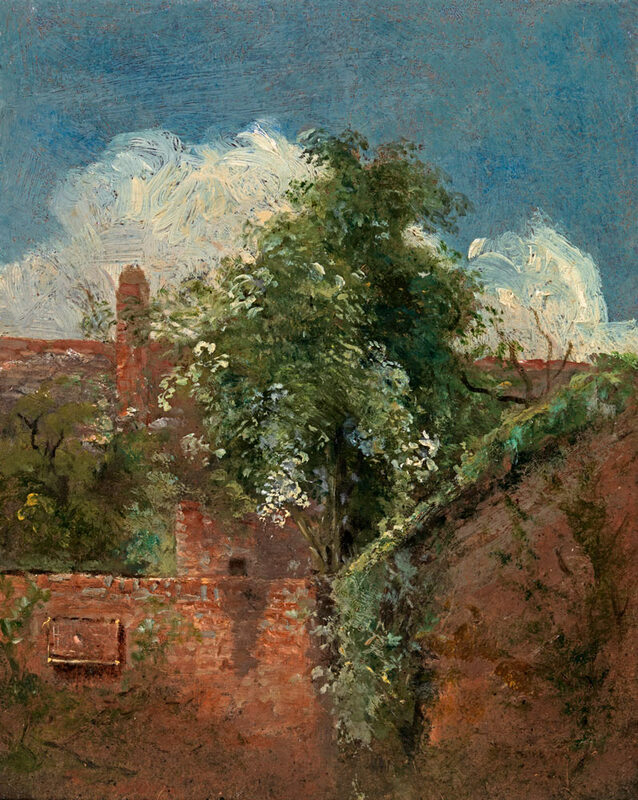 View of the back of a terrace of houses is very close, both in its support (millboard) and its subject (an elder tree in blossom over a garden wall) to another study Constable also painted in Hampstead around this date, The elder tree, c.1822, today in Dublin City Gallery The Hugh Lane[iv]. Both these sketches were surely painted in close proximity to each other in this pocket of streets close to Lower Terrace and the western edges of the Heath. Capturing scenes in Hampstead’s back lanes and hidden corners, they reflect Constable’s pure delight in sketching directly in front of the motif, in the open air (or from a window in his Hampstead lodgings) as well as his remarkable powers of observation: elder trees in full flower, the play of light or cast shadows on a brick wall, rambling foliage tumbling over a roof. These sketches are ‘snap-shots’ of the natural world painted without consideration for the more formal aspects of landscape composition. In this respect they recall the similar, equally appealing plein-air studies made by the Welsh painter Thomas Jones in Naples and elsewhere in the late eighteenth century. When working in the open air, artists at this date tended to prefer to use papers or millboards (or pasteboards) as painting supports. Not only are these more portable than canvas or wooden boards but, when suitably prepared, they are also highly absorbent, allowing for oil paints to dry more quickly[v]. When Constable first embarked on outdoor oil sketching in earnest around 1808 to 1810, he tended to use millboard as his painting support. Within a few years, however, he had mainly switched to adopting paper instead, and indeed most of his Hampstead sky studies dating from the early 1820s were originally painted by him on paper[vi]. View of the back of a terrace of houses is therefore particularly interesting in belonging to a small group of Hampstead oil sketches which Constable chose to paint on millboard[vii]. Like Constable’s sky studies viewed over the tops of buildings, View of the back of a terrace is remarkable for its immediacy and the spontaneity of its brushwork. Characteristically for an example of a plein-air study painted at this date, Constable uses broad brushwork combined with more carefully rendered areas of detail. The large cumulus cloud, for example, is painted with bold, vigorous strokes and parts of the foreground are also very broadly rendered or else barely defined. By contrast, Constable uses tiny touches – little dabs – of white paint, applied with the brush, to indicate the white umbels of the elder flowers, which are both precise and yet expressive at the same time. This painting comes from the collection of John Hay Whitney (1904-1982) and Betsey Cushing Roosevelt Whitney (1909-1998) and hung in their 1930s Modernist house, Cherry Hill, on the Wentworth Estate, Surrey. Betsy Cushing was one of three beautiful and glamorous Boston sisters who all made prominent marriages: her older sister Mary, to Vincent Astor and her younger sister Barbara, known as Babe, to CBS founder William Paley. Betsey married James Roosevelt II, son of the future President Franklin Delano Roosevelt, in 1930. In 1942 she married John Hay Whitney, who was appointed American Ambassador to the Court of St James in 1957. The couple purchased Cherry Hill a year later and maintained their connection with Britain for the rest of their lives. They had several other homes, including the magnificent Greentree estate on Long Island. The Whitneys were prominent philanthropists and art collectors, owning Renoir’s celebrated Bal du Moulin de la Galette, 1876, among many other works. Betsey bequeathed eight paintings to the National Gallery of Art, Washington DC, including Vincent van Gogh’s Self-portrait, 1889, and Henry Matisse’s Fauve masterpiece Open window, Collioure, 1905. Constable, with Turner, is the most important British landscape painter of the nineteenth century, revered for his ‘naturalism’ while Turner’s landscapes suggest grandeur and generalisation. Unlike Turner, Constable did not roam far abroad on picturesque tours, instead creating his art from familiar, much-loved scenery. John Constable, the son of a prosperous miller, was born in East Bergholt, Suffolk in 1776. In 1799 he attended the Royal Academy Schools and had informal tuition from the landscape artist Joseph Farington, as well as copying Old Masters. Constable returned to Bergholt and first exhibited at the Royal Academy in 1802, surviving on family money and a modest portrait practice. In 1806 he toured the Lake District, making watercolours of the ‘sublime’ scenery. ‘Truth to nature’ was Constable’s credo; from 1808 he made oil sketches from nature as well as pencil drawings of parts of his compositions. These were then used as aide-memoires for an exhibition piece painted in the studio, such as Flatford lock and mill (RA 1812), a view of his father’s mill. In 1811 Constable visited Salisbury at the Bishop’s invitation and formed a lifelong friendship with the Bishop’s nephew the Rev. John Fisher. He returned to Salisbury throughout his life, painting some of his finest, most moving pictures of the Cathedral in sunshine, showers and overarched by a rainbow. Like the productive fields of the Stour valley where he grew up, the Cathedral represented for the deeply conservative Constable the core values of England which must be preserved in a changing, often threatening world. In 1809 Constable had fallen in love with Maria Bicknell, granddaughter of the Rector of East Bergholt, but they were not able to marry until 1816, because her family (quite correctly) doubted Constable’s ability to support a wife. That year Constable moved permanently to London and began to produce more ambitious paintings such as Whitehall Stairs, June 18th 1817 (the opening of Waterloo Bridge) (1817; exhibited 1832; Tate Gallery, London) and the ‘six-footer’ Stour view The white horse (Frick Collection, New York) which was shown to critical acclaim at the Royal Academy in 1819. That same year Constable became an Associate of the Royal Academy. Seeking fresh air for his consumptive wife, he rented a house at Hampstead and from circa 1820-22 produced a series of brilliant oil studies of skies, noting times of day and weather conditions. From 1824 family holidays in Brighton inspired oils and watercolours of panoramic coast scenes full of light and air. In 1824 Constable sold The haywain (RA 1821; National Gallery, London) to the Parisian dealer John Arrowsmith. The painting won a gold medal in the Paris Salon and Constable’s naturalistic approach to landscape and free, expressive brushwork was highly influential on French painters such as Delacroix and Huet. In 1828 Maria Constable died; the following year her devastated husband was elected RA and remarked bitterly that there was now no beloved wife to make the honour sweet. Constable’s bleakness is reflected in stormy, expressionistic paintings like Hadleigh castle, 1828-9 (Yale Center for British Art, New Haven, Connecticut), where the ruin symbolises himself. In 1830 Constable supervised John Lucas’s mezzotints after his paintings, English landscape. Constable increasingly saw landscape in terms of chiaroscuro – composition unified by light and shade – and was less interested in individual elements, symbolism, or ‘historical motifs’ in his painting. Like Turner, though with a totally different approach, he believed passionately in the importance of landscape painting within the heirarchy of artistic genres. Landscape painting was not inferior, but was a paramount expression of a nation’s genius. Constable was an excellent, dedicated teacher at the Royal Academy Schools and lectured on the history of landscape painting. A touchy, affectionate and utterly sincere man, he died in London on 31st March 1837. The work of John Constable is represented in the National Gallery, London; the Victoria and Albert Museum, London; the Tate Gallery, London; the National Gallery, Washington DC and the Louvre, Paris. John Constable, Hampstead Heath, with the house called ‘The Salt Box’, c.1819-20. Oil on canvas: 15 x 26 ½ in / 38.4 x 67 cm. John Constable, View of Lower Terrace, Hampstead, c.1822. Oil on canvas: 9 ¾ x 13 ¾ in / 24.8 x 35.2 cm. V&A Museum, London, inv. no.584-1888. John Constable, View in a garden, with a shed on the left, c.1821. Oil on paper laid on canvas: 12 x 9 ½ in / 30.2 x 23.8 cm. John Constable, The elder tree, c.1822. Oil on millboard: 11 ¼ x 8 ¾ in / 28.6 x 22.3 cm. Dublin City Gallery The Hugh Lane, inv. no. 537. [i] In the Hampstead Rate Book for July 1834, 6 Well Walk is entered as ‘Empty, late Constable’ (L Parris and I Fleming-Williams, Constable, exh. cat., Tate Gallery, 1991; see Chronology, p.36). [ii] For Constable’s sky and cloud studies, see especially John E Thornes, John Constable’s Skies: A Fusion of Art and Science, 1999; and ed. E Morris, Constable’s Clouds, exh. cat., 2000, National Galleries of Scotland and National Museums and Galleries on Merseyside. [iii] Ed. RB Beckett, John Constable’s Correspondence VI: The Fishers, Ipswich, Suffolk, 1968, p.71; letter from John Constable to John Fisher, 4th August 1821. [iv] G Reynolds, The Later Paintings and Drawings of John Constable, 1984, New Haven and London, no.21.115 (An elder tree in blossom over a garden wall, oil on board, 11 ¼ x 8 ¾ in/ 28.6 x 22.2 cm). [v] For a fuller discussion of Constable’s painting supports, see especially S Cove, ‘Constable’s oil painting materials and techniques’, essay (pp.493-529) in Constable, exh. cat. 1991 (cited note i above). [vi] Albeit some of them have subsequently been mounted onto canvas. [vii] See Reynolds, op cit, note iv, 21.102 (A house in the trees at Hampstead, oil on board, 11 ¾ x 9 ½ in / 29.8 x 24.1 cm; private collection) and 21.115 (cited note iv). In addition, one of Constable’s sky studies, Reynolds 22.18, is also painted on millboard (10 x 8 ¾ in / 25.4 x 22.2 cm; private collection).